Preheat oven according to cake mix package directions. Mix cake mix, eggs, water, rum and vegetable oil. Grease and flour two nine-inch cake pans. Pour batter evenly into cake pans, bake according to package directions. Combine Jell-O pudding mix with Cream of Coconut and milk. Stir with a whisk until thickened, chill until ready to ice the cakes. Remove cakes from oven, cool on wire rack. Slice off rounded top of each cake to make them level. 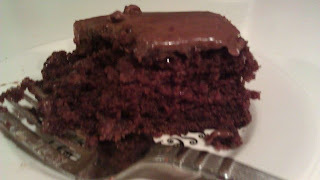 Slice each cake into two layers, resulting in four cake layers. Spread the jell-o over the first layer, then sprinkle with 1/3 of the pineapple. Top with another layer of cake, and repeat. After putting the fourth layer on top, spread the remaining jell- over the top and sides of the cake. 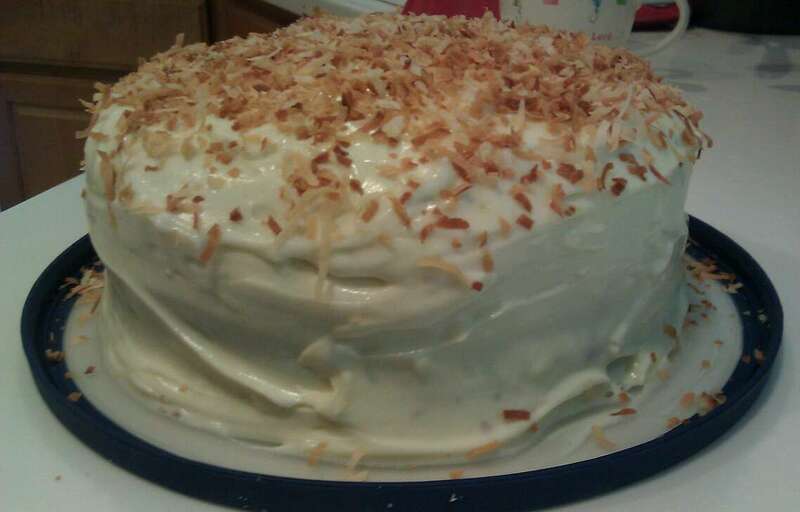 Sprinkle the top of the cake with toasted coconut. Chill until ready to serve. After the birth of our 4th baby girl, this was one of the desserts that my mother-in-law brought me along with wonderful meals, comfort food, at its best. If you've followed along for a few posts, you may have read about Jackie's Journey. Stunned by the diagnosis of multiple, life-threatening congenital heart defects for Jackie when she was 5 days old, I was immediatley ushered into a whirlwind state of desperation, crying out to the Lord to save my daughter's life. In these weeks of staying by her side at Texas Children's Hospital, from the neonatal icu, to the cardiac critical care unit, to the 15th floor to home, God showed his kindness to our family time and time again in the most amazingly detailed ways through family, friends, doctors, nurses, hospital staff, and people we had never met. Comfort came in the most ordinary of ways, made extraordinary by our extraordinary need: meals brought to us in the hospital and at home, a parking garage card, brownies, magazines to read, taking care of our other daughters, a hug, notes of support on Jackie's carepage...I could go on and on. 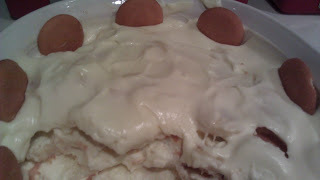 And so, Roylene's banana pudding, the taste of comfort, because very often, when you meet someone's physical need, you touch their soul just as much. In a large bowl, combine the sweetened condensed milk and water. Add pudding mix and whisk well. Chill 5 minutes. Fold the whipping cream into pudding mix. Spoon 1 cup pudding mix in a 2 1/2 quart glass bowl. Top with wafers and bananas. Repeat twice. This recipe has survived the test of time. When the kids were small. this was the most requested dessert and birthday cake. It is still requested today, and no wonder. It is moist, gooey and rich. Bring these above ingredients to a boil and set aside. Add the above ingredients to the first mixture. Combine these ingredients. Add all 3 ingredients together and beat until smooth. Bake at 350 degrees in a buttered and floured 9x13-inch cake pan until cake tests done, about 30 minutes. Stir together the first 3 ingredients in a pot. Bring to a boil, stirring constantly. Boil for 5 minutes or less. Add vanilla and powdered sugar; mix well. Spread on cake while hot. 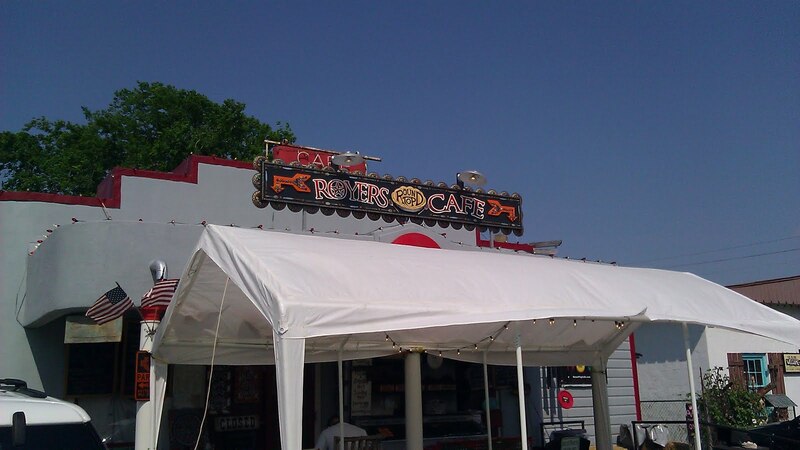 The Royers know that food and friendship alone will grow cold and hollow if they do not transport us to consider the deeper issues of life. Bud and Karen are not narrow dogmatic, or pushy, but they do invite their guests through food and conversation to consider the heart's deepest desire and the soul's greatest emptiness. They know how to fill the stomach, the heart and the soul. I think you will find their invitation hard to refuse.